Nurses like many other healthcare professionals are near constantly on the move. They are frequently called upon to apply their skills and knowledge in order to ensure the safety and comfort of their wards. With smartphones and internet connectivity becoming commonplace, many institutions have tried to use mobile phones to allow nurses to practice their skills on the move. 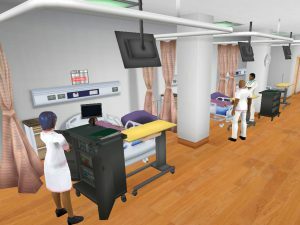 Playware’s 3DHive.mobi platform has been utilised in two case studies by leading Institutions in Singapore that have successfully tested and adopted mobile games as a method for training nurses. Study aimed to validate whether nursing education could be effectively delivered via a mobile application, so as to improve the reach of training and increase the number of nurses trained per in-service training module. To design and evaluate the effectiveness of serious gaming in enhancing knowledge, confidence and skill performance of nursing students in management of blood transfusion. 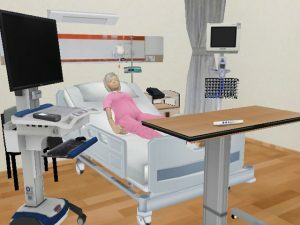 The study “revealed the effectiveness of serious games in enhancing knowledge and confidence of nursing students” and is a “promising approach to optimize learning when blended with hands-on simulation training”. 3Dhive.mobi was designed as a mobile-games for learning platform that focuses on the authentic practice of skills. Developed by Playware Studios Pte Ltd in a four-year collaboration with the Infocomm Development Authority and the National Research Foundation of Singapore, it has the features and functionalities that an enterprise needs to create and manage training as well up skilling of its workforce.